Coloured glass, delicately ornamented with gold, is a technique unique to Pratapgarh in Rajasthan. The uniqueness lies in the manner in which the intricately carved gold is sandwiched into the coloured glass, giving it an appearance of embossed golden glass. 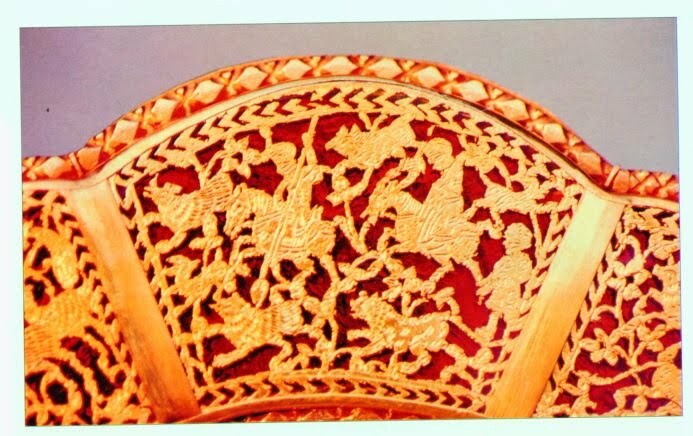 Its craftsmen carry the title “Raj”. For more than 400 years the family of Jagdishlal Raj Soni, who nowadays is a national award winner in this craft, are practicing this art and fathers teach it only to their sons, because of fear that daughters, after marriage might take it to their in-laws place. Thewa is a must-include ornament in the trousseau of any bride in a rich family in India. It is said Queen Elisabeth has Thewa ornaments. A gift-box of Thewa was sent by the Government of India as wedding present to Prince Charles and Princess Diana.